At some point in 2012, the final i’s will be dotted and t’s will be crossed so 15% ethanol can finally become the new consumer choice at the pump. 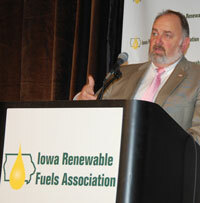 The final panel of the day at last week’s 6th Annual Iowa Renewable Fuels Summit focused on preparations that are being made to make sure retailers and consumers have all the information they need to make an informed choice when it comes to E15. 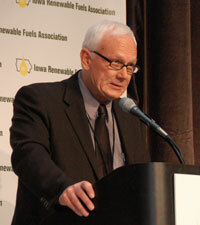 “A lot of what consumers know now is wrong,” said Ron Lamberty with the American Coalition for Ethanol (ACE). Lamberty says while there are consumers who are opposed to the use of ethanol and are unlikely to change their minds, there is a good percentage of people who say they would use E15 if it were available. “When we do get E15 out to the marketplace, one of the things we have to make sure we tell people is that it’s out there and they can use it,” he said, noting that the main thing consumers need to know about E15 is that it is the most tested of fuel in history. Another point that Lamberty believes is important for consumers to know is that the E15 approval for cars and light trucks newer than 2001 is not a mandate. “Approved for and not required,” Lamberty said. “No stations have to sell it and nobody has to buy it,” he said, although the industry believes that once consumers do try it they will want to use it. As to when E15 will make it to the market, Lamberty says it is anyone’s guess, but he expects Iowa will be one of the very first places it will be available. Emick says their customers appreciate that they are promoting flexible fuels because of their environmental friendliness and competitive pricing, and he sincerely believes in the product and wants to see it continue to grow.